Summer Guitar of the Month: Congrats LeftyDaveZ! Color is Desert Burst. I had a choice on either a Light Burst or a the Desert Burst. I really liked the DB due to it’s unique maple cap. 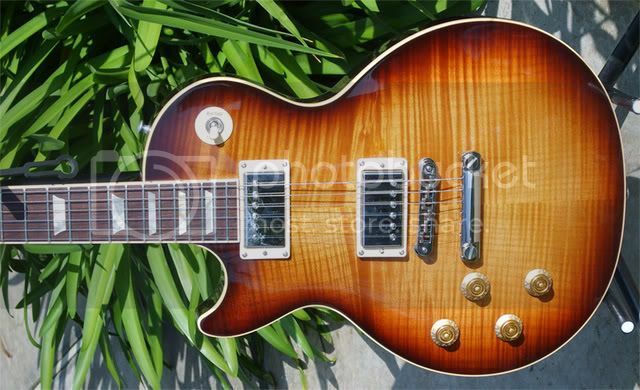 Personally I wouldn’t think that Gibson would have used that wood on anything else but a lefty guitar. Kind of allegory to being left handed: Having to make due. The only mods to this guitar are speed knobs. I want to keep this as original as possible. I really like the Burstbucker pickups and the controls roll very smooth. I can do minute adjustments and get a sound I like. As you know finding a Les Paul in lefty is dicey at best and I really lucked out on getting this one when I did, for the price I did. I wish CC Music was still around because Saul really took care of his customers and treated us lefties pretty well.